Hormonal changes happen to both men and women as they age. These changes are normal with minor if any symptoms. However, it is very common for symptoms to occur with people who eat a modern diet. This article discusses testosterone, the causes of low T and what can be done to help increase it. Testosterone will naturally start to decline in men in their 40’s or 50’s. In general, there is not much that can be done about it. Specifically though, there are things that will help keep it from dropping as much. When younger men, and to some extent, women, experience low testosterone, there is usually a reason. Let’s start by looking at some of the symptoms of low T.
Do any of these remind you of any of the symptoms of adrenal fatigue? 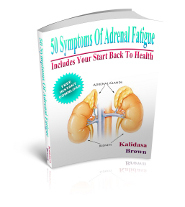 It should, since it adrenal fatigue is one of the causes though there are several others. Injury is very specific and would usually respond best to medical treatment or surgery. Testicular cancer can be treated successfully with natural techniques, but that is a very long subject. One of the medical treatments for testicular cancer involves using drugs to stop the production of testosterone. There is not much that can be done about that until the cancer is cured and the drug treatment stopped. Other infections, including HIV, can be treated with natural techniques. This is another subject that would take a book to discuss. Liver and kidney disease can also be treated naturally. One of the best treatments for liver disease is the herb, Milk Thistle. Other treatments are beyond this article. The primary cause of all hormonal imbalances is also the primary cause of low T. That is, insulin resistance which is often called type 2 diabetes, is caused by eating processed foods. Processed foods include sugar of any kind, even unprocessed honey, dried fruit, fruit juice and all grains that have been ground up in any way. These processed foods also lead to weight gain, obesity and most major illnesses. Changing habits is the best way to increase testosterone levels when it is caused by hormone disorders, diabetes and excess weight. There are supplements and herbs that will help these issues, but since this article is about testosterone the specifics for those issues aren’t covered here. There are other articles on this site with much of that information. Now we’re down to the specifics of exactly what nutrition it takes to treat low testosterone directly. All the above issues should be considered first though. It should be noted here that using a testosterone drug like AndroGel or Testosterone Cypionate will make most men feel great for a few months. For the most part though, they will lose efficacy in time, and often cause serious problems later, primarily cancer. The first consideration is adrenal stress. Treatment for adrenal fatigue alone is very likely to bring testosterone back to a normal level. But, there are supplements that can have a direct effect. There are only 5 supplements to consider when looking to increase testosterone directly. Copper, magnesium, B12, B6 and folic acid. B6 should be in the enzyme activated form, P5P. The B12 needed is usually cyanocobalamin, though methylcobalamin should also be considered. Another supplement that could be considered is DHEA. I don’t generally encourage people to use DHEA, and if I do I have them use 7 keto DHEA, because DHEA can be dangerous. DHEA can through the hormone system out of balance, and even cause a higher production of hormones that can cause cancer. The best thing to do instead is to treat the adrenal glands so they can produce the right amount of DHEA instead of trying to guess with a pill. Very rarely will all the supplements be needed. But, most people need magnesium, B12 and B6 anyway. To dose magnesium start with two grams at bedtime. Take it away from calcium because they compete for the same receptors. Calcium in the morning, and magnesium at night is the best practice. Note: the below links are to sources for the named supplements. Magnesium doses need to be increased slowly, another gram every three or four days, until it causes diarrhea. 500 mg to one gram less than what causes diarrhea is the ideal dose. B12 dosage is usually between 200 and 1000 mcg. It is generally safe to take more than is needed. B6 as P5P usually comes in 50 mg tablets. Sometimes it will say 35 mg or something close to that. These are usually the same, it is just being looked at a different way. Four of these tablets a day in two doses is the ideal amount to take though some people will need more or less. A good folic acid dosage is in the 400 – 500 mcg range. However, if you eat plenty of green leafy vegetables you are not likely to need any. Copper and zinc balance each other out. In general they are best taken together. And, most people, especially men, need zinc. But, too much zinc can cause a copper deficiency because of their relationship. The ideal is to take them together in the ratio of 15 zinc to 1 copper unless the ratio is already off. Knowing if you have a much different ratio is necessary to determine exactly how much of each is needed. A balanced dosage could be around 100 mg of zinc to 6 or 7 mg of copper. Those are the primary causes and treatments of low testosterone. The main issues have been covered while there are several less common issues that require different treatments, some quite extensive. You can schedule a phone healing session if you want to know exactly what is going on with you. You can contact me through the contact form on this site. Be sure to post this article to your social sites so your friends can benefit. Thanks! Edit: I found this great supplement that has a perfect combination of supplements. You can grab it here. Next: Hot or Cold for Back Pain?